There aren’t too many movies quite like Lady in White. Propelled by a sprawling, mythology-rich narrative that works to cloud a nostalgia-tinted vision of Rockwellian America, it almost resembles the work of Stephen King. However, it resists complete darkness an errs on the side of broad, high fantasy in a way King’s work rarely does—there are times when you rightly wonder just who the audience is for this weird, socially-conscious ghost story that often feels family-friendly despite its heavy themes and sometimes lurid material. Childlike innocence is rarely associated with horror unless it’s being absolutely corrupted and destroyed, but Lady in White stops just short of that: to the end, it maintains that even the most disturbing urban legends can still bring some sense of comfort. 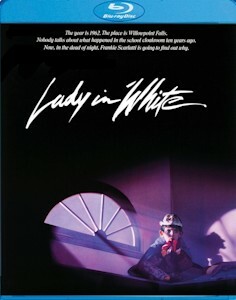 Often the cinematic equivalent of a warm blanket for baby boomers (and those nostalgic for this fabled era), Lady in White unfolds in Willowpoint Falls, a small town in rural New York removed from the nearby “big city.” Actual horrors are not supposed to reach this slice of Americana, which is currently outfitted for its annual Halloween celebrations. Children walk the streets in dime store costumes, while the town is cast in a perpetual autumn glow, its brown and orange earth hues making each frame fit for publication in the Saturday Evening Post. This is the idyllic scene that Boomers have never been able to forget, that mythical time when America was “innocent”—before Kennedy, before escalation in Vietnam, before Watergate. It comes as no coincidence that the film is perched 1962, the same year George Lucas chose as his own ideal tableau in American Graffiti. To drive the point home even further, the film is narrated by a now middle-aged Boomer in Frankie Scarlatti; now a successful horror author, he’s returned home to wistfully recount his real-life encounter with the town’s legend, the titular Lady in White. As such, the film is awash in a sort of nostalgia: less a ghost story and more of a fondly relayed memoir, it floats along, as if carried by a fall breeze. A bouncy, light-hearted score accompanies those innocent images of a Halloween that perhaps never existed, at least not as Frankie (Lukas Haas) recalls it: he’s sent off to school by his loving father (Alex Rococo), decked out in his costume as he and his older brother (Jason Presson) spill out into the street. Some harmless mischief follows when Frankie has a minor accident that foreshadows the day’s shenanigans, which climax with a pair of bullies conspiring to lock Frankie in the school’s coat room. It’s a turn of events that starts to turn Lady in White on its head ever so slightly: what seems to be a harmless prank escalates into a bizarre experience for Frankie, one that has him seeing the ghost of a little girl before a stranger intrudes and nearly strangles him to death. This is the sort of thing that isn’t supposed to happen in Willowpoint Falls, a town that’s practically a northeastern Mayberry. However, it becomes clear that the façade is deceptive, as the town is rocked by the revelation of a decade-long rash of child-killings and disappearances. It’s a microcosm of this American gilded-age: just as this seemingly perfect town holds a dark secret, so too was this era marred by an obvious racism that many Americans choose to forget during their reminisces. Director Frank LaLoggia tackles that injustice head on when black janitor Willy Williams (Henry Harris) is charged with the crime despite little-to-no evidence. Some of the townspeople all but acknowledge that it’s a farce but also declare him to be a “perfect scapegoat” because of his skin color. The sooner they can convict him and move past this episode, the better—even if it means allowing the actual killer to roam free. For a film that’s otherwise caught up in urban legends and ghost stories, Lady in White is most effective when it’s focused on this all too real horror. Nothing else in the film hits you right in the chest the way this subplot does at various points, whether it’s Williams’s wife fleeing the church in tears or the poor, innocent janitor meeting a shocking, cruel fate. It often feels like this should be the film’s actual plot rather than a side ordeal, particularly if LaLoggia’s aim is to undercut nostalgia surrounding this time period. In the film’s sprawl, however, this plot thread often gets a bit lost, almost as if it were serving as the film’s intercalary chapters. If I’m being honest, it has little bearing on the main plot beyond establishing Frankie’s father as one of the town’s few upright, honest citizens looking to seek justice for Williams. Otherwise, it feels like LaLoggia’s attempt to couch concerns about social justice into what ultimately feels like a dark fairy tale. It’s what the film is really about, but he knows he’s also beholden to various other plot points that sometimes feel like they belong to another movie, resulting in a tonal dissonance that’s either jarring or appropriate depending on how much credit you’re willing to give to LaLoggia. And does he ever have a mouthful of plot to deliver: not only do Frankie and his brother attempt to discover the real killer, but this quest also becomes intertwined with the local town legend that insists a spectral lady in white haunts the countryside. What’s more, another oft whispered-about woman (Katherine Helmond) lives in a spooky old house where the town’s children fear to tread. Resting in the shadow of an ethereal swamp, it’s a picturesque version of a small town’s haunted abode that every kid knows about and doesn’t dare to approach (until they do). Somehow, it’s all integral to Frankie’s other quest to appease the spirit of Melissa (Joelle Jacobi), the slain girl whose tragic murder remains unsolved. Suffice to say, Lady in White does not lack for plot, and LaLoggia stretches it out, allowing the proceedings to glide from Halloween to Christmas, as if the film were looking to pervert every fond childhood memory. But I’m not sure that’s exactly what happens here: while LaLoggia is certainly interested in juxtaposing that fondness with a stark reality involving child murders, he remains committed to a wistful tone. Frankie’s childhood trauma becomes part of the lore he grew up passing around the campfire—sure, he learns the terrible, awful, and sad truth underpinning these stories, but they remain mythologized nonetheless. His addition feels like a further embellishment rather than trying to approach the “truth.” It may be fair to say Logia sort of buries the lede in his attempt to tarnish the rose-tinted glasses, especially since Frankie’s tale ends in rather comforting fashion: as horrifying his climactic encounter with the killer is, it’s also rather whimsical, as spirits flit about, buoyed by a bombastic, swelling score. However, this is where I’m willing to cede LaLoggia some credit. In many ways, Lady in White captures the duality of the American experience during this era: while Frankie is able to fondly recall his childhood in the face of such horrors, Willy Williams’s family would certainly spin a different tale. Their experience is a sort of horror that Frankie will never know, and it being pushed to the margins feels oddly, cruelly apt. For decades, this has been the case: for every Boomer nostalgia piece centered on white America, there are hundreds of stories involving minorities that are pushed to the side, perhaps because they don’t conform to this perception of America’s “golden age.” If only unwittingly, LaLoggia’s film reflects that in a way that makes it supremely interesting—it thrives on both a childlike terror and reveals a legitimately horrifying reality. Institutional racism, child-slayings, and an urban legend all collide at once, resulting in an odd, complicated portrait of this time period. Does this make Lady in White a tonal mess? Perhaps—it’s certainly a film that wears its heart on its sleeve in its recreation of what is essentially an extended childhood memory. It follows that it feels so earnestly scattershot in its attempt to capture innocence and darkness all at once, making it an odd duck. Of course, I happen to like odd ducks, particularly ones that are as lucid as Lady in White. Sometimes, a film just captures a certain mood (in this case, nostalgia for an ideal time that never existed), allowing it to transcend its warts. LaLoggia has a knack for highlighting certain touchstones—be it Rococo’s underplayed dignity or the way light strikes autumn leaves—that make you wish you could dive right into this world, however strange, messy, and complicated it may be. Of course, even this is deceptive, as, in the end, he lands a couple of sucker punches that remind us that innocence isn’t lost—in many cases, it never actually existed at all. One of the more underappreciated horror efforts of the 1980s (a time period that saw the landscape drowning in blood and guts—no wonder this one was lost in the shuffle), Lady in White finally receives its due with a terrific 2-disc release from Scream Factory. It boasts three separate cuts—including a never-before-seen “extended director’s cut,” making it definitive from the standpoint alone. However, as we’ve come to expect, Scream Factory doesn’t just stop there, as they’ve ported over several archival supplements, like LaLoggia’s feature commentary. Loads of behind-the-scenes material also surfaces here: all told, there’s nearly 90 minutes of it, some of it accompanied by an optional commentary from the director. LaLoggia also provides commentary for 36 minutes of deleted scenes (in case you were wondering just how much more sprawling Lady in White could have been). A promotional short film accompanies the typical assortment of marketing material (trailers, photo galleries, TV spots, radio spots) to round out a complete package—once again, this is one of those Scream Factory that doesn’t carry the “Collector’s Edition” tag, but it certainly could. Regardless, this is a fine release for one of the 80s more unique, offbeat efforts. It’s a shame that LaLoggia only directed one more film after Lady in White—for all its messiness, it’s nothing if not utterly sincere, and I love that it's quite unlike just about anything else that was released during the late 80s.